US officials continue to maintain that American policy towards Israel will undergo changes in the wake of pre-election comments made by Prime Minister Benjamin Netanyahu, in which he stated that no Palestinian state would be established on his watch. Israel's occupation of Palestinian territories has lasted for nearly five decades and “must end,” White House Chief of Staff Denis McDonough said in a Monday address to the left-leaning Jewish American lobby group J Street. McDonough reiterated America’s long-standing support for a two-state solution to the impasse between Israelis and Palestinians – an agreement that would be based on 1967 lines and include mutually agreed land swaps. 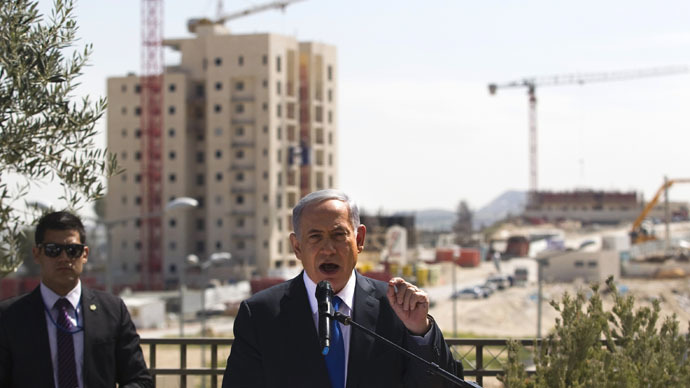 However, he said Netanyahu’s comments have cast doubt upon Israel’s commitment to such an agreement, despite the prime minister’s attempts to backtrack in the wake of his re-election on March 17. “We cannot simply pretend that those comments were never made, or that they don’t raise questions about the prime minister’s commitment to achieving peace through direct negotiations,” McDonough told the crowd, as quoted by the Guardian. According to Haaretz, McDonough – one of Obama’s close advisers – did not detail just how US policy would change over the coming months, but he did reject the notion that US reaction to Netanyahu’s comments is based on personal feelings of anger. Netanyahu has had a troubled relationship with President Barack Obama since he came into office, and the White House was widely believed to have preferred a new leader to take the reins in Israel. McDonough said US commitment to Israel’s security and military will remain. Several reports over the past week have suggested that the US could stop shielding Israel from resolutions at the United Nations that seek to recognize a Palestinian state or outline the parameters of a two-state deal. Meanwhile, in an interview with Israel’s Army Radio, US Ambassador to Israel Dan Shapiro also said America’s approach to the country would be re-evaluated – again pointing to Netanyahu’s comments. “This was not Israel’s stance until those comments. It is confusing and raises doubts regarding Israel’s true stance,” Shapiro said, as quoted by Jewish news website JP Updates. "The question we are still focusing on is how to progress towards the solution of two states for two nations." “I cannot deny that we have serious issues with some statements said during the elections season. One of them is the shirking of a ‘Palestinian’ state. We believe that it is the only solution that will safeguard a Jewish and democratic Israel. Netanyahu said that he will not lend a hand to the establishment of a ‘Palestinian’ state so long as he is Prime Minister,” Shapiro said. Netanyahu has tried to walk back multiple comments since his victory last week. He has denied changing his position on Palestinian statehood, saying he actually meant that he doesn’t believe the possibility for a Palestinian state exists in the current political climate. Israeli Ambassador to the US Ron Dermer also said that Netanyahu’s comments were misinterpreted. In an interview with The Huffington Post, President Obama himself stated that change could be coming, adding that the US is “evaluating” its policy based on the prime minister’s statements. “We take him at his word when he said that it wouldn't happen during his prime ministership, and so that's why we've got to evaluate what other options are available to make sure that we don't see a chaotic situation in the region,” Obama said.